If you are cringing every time you open your bills every single month, well, you’re definitely not alone. 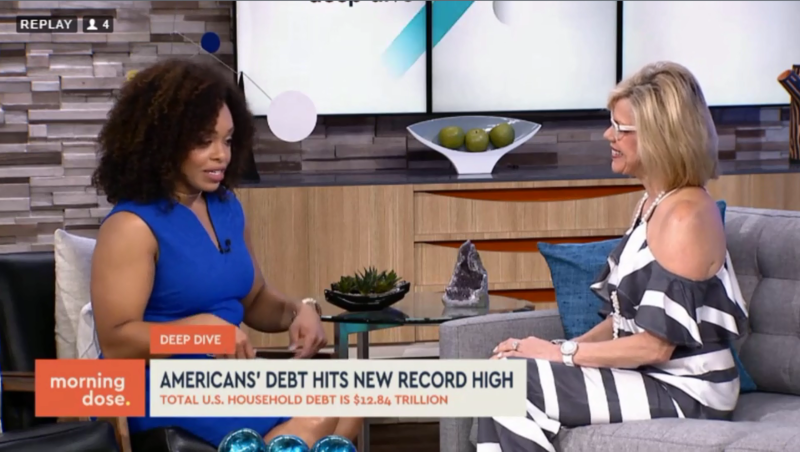 According to a new report from the Federal Reserve Bank of New York, Americans’ debt level has hit a new record high. Total U.S. household debt has hit nearly $13 trillion in the most recent quarter. That is up over $500 billion over the same time last year. Well, that study also found that the average American is about $37,000 in debt. So 1 in 10 Americans are more than $100,000 in debt, and that’s not even including your mortgage. Credit card debt is also at a record high. According to the Federal Reserve, U.S. households collectedly have more than $1 trillion in credit card debt. And as for millennials, well, it’s not much better. Less than one in four millennials with debt say they actually pay it off as much as they can each month. And 32% admit to frivolous spending. And if you have a lot of debt, well, that could be a big problem in the relationship department. A survey released by Chase found 37% of Americans say that high credit card debt would be a relationship deal-breaker. So that is why 1% of women, and 15% of men, think that it is acceptable to talk finances on the first date. Well, I don’t know about that, but we are gonna keep talking finances. Laila. Laila Muhammad: Yeah, here to break it all down for us this morning is Cathy Dewitt Dunn. She’s the President and CEO of Dewitt and Dunn. Good morning. Laila Muhammad: Let’s talk about this, because my head was hurting listening to all these numbers. First of all, when you hear the trillion dollars collectively on the credit card debt, what does that say to you about our spending as a country? Cathy DeWitt Dunn: We’re spending way too much. I mean, this is the highest level of debt that we’ve seen since 2008. Laila: Why? Why are we racking up more debt? Cathy: That is such a great question. I have a feeling that people aren’t staying within their budget. You know, we kind of are the “me” generation. We wanna buy it, we don’t understand what that’s really gonna mean later down the road. But we really need to take a look at our budget and stay within it because one of the things later down the road is you’re not gonna be able to finance your retirement years later down the road, and the income that you’re gonna need. So it’s really important to sit down and focus in on it now. Laila: Is there any advice you give your clients when it comes to…okay, I make X dollars, right? How much, you know, line of credit should I have for a credit card? You could sorta give a ratio for that, or an idea? Cathy: Yeah, I mean, I think one of the things that, if you’re gonna use, is called the credit utilization ratio. And you usually try to stay within 30% of whatever your credit line is on that credit card, because that won’t impact your credit score. And make sure you pay that off every single month versus letting it accumulate, because if you just make minimum payments on your credit cards, it’s gonna take at least 10 years to pay that off. Laila: Absolutely. Let’s talk about some of the things you can do to, sort of, get back on track. Let’s say you’re at home watching this, and you have a lot of credit card debt, you have your student loans, you have your mortgage. How can you start to get back on track? Cathy: Well, it feels overwhelming at first. Cathy: But like you said, just put everything out on the table, get a sheet out, and say, “This is how much money I make.” And then take a look at each of the items that you have, and put it on a spreadsheet. And stay within your budget and make sure, “Wait a minute, I’m way over. My bills exceed what my income is.” Well, then, you know what you need to do? You need to maybe get rid of cable TV. Take a look at reducing your mobile bill account. And there’s so many things that you can do, a hundred dollars here, or a hundred dollars there. Stop eating out during the middle of the day, save money, you know, at lunch. Pack your lunch. There’s lots of things that you could do along the way that really are gonna make a really big impact on your finances. And make sure to pay your highest credit card debt down first. Cathy: That could really help. Laila: To help you organize. I mean, I got one early on just so I could make sure my money’s going in the right way. I needed to learn how to pay myself. That’s why I had to get one. Like, how to pay myself first and still take care of all the bills. Cathy: And that’s a great point, because what I tell all of my clients, like, let’s just say you are contributing to your 401k, there’s free matching funds, start off with maybe 10% or 15%. See how that goes within your budget, move that up to as high as 30% of your salary, because that money is really gonna be needed later down the road. But, you know, start small, and then continue to build on that. Because just right now, you know, with credit card debt, student loan debt, automobile debt, you name it, but what about making sure you’ve got money put away for your retirement later down the road. Laila: Yeah. You also agree, if the person got a lot of debt coming into the relationship, honey, you might wanna find somebody else. Laila: Next. Right. All right, Cathy Dewitt Dunn, thanks for joining us this morning. She knows. I agree with her on that.